Poopa Dweck is the preeminent authority on the food, ways, and customs of the Jews of Aleppo, the world’s largest and most flourishing community of Sephardic Jews. 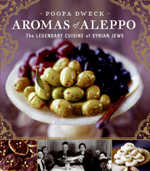 Aromas of Aleppo:The Legendary Cuisine of Syrian Jews (Ecco) is Dweck’s fourth work on the subject and the most comprehensive source for the cuisine and customs of Aleppian Jews to date and was winner of the National Jewish Book Award. 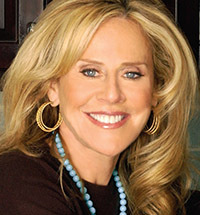 She speaks to Jewish organizations, culinary retailers and organizations, across the world, most recently in China, Israel, and Turkey. Dweck comes from a long line of Syrian cooks, whose migrations have spanned the globe from the northeastern hill town of Aleppo in Ottoman Syria to Italy to the United States and South America. Her outlook is shaped by her steadfast devotion to the traditions of Aleppian Jewry and a worldly appreciation of all walks of life. Constantly developing exciting and new relationships with the openness inherited from her parents, Dweck’s mission is to share her knowledge of Syrian-Jewish cuisine to the community beyond. Aromas of Aleppo allows the sophisticated cook to finally discover the best of Dweck’s work – and the best of a special community. The cuisine of Aleppian Jewry gracefully combines Mediterranean and Levantine influences, ranging from rudimentary workman’s meals fit for the midday Aleppo market siesta to the regal opulence of a 12-course Passover Seder. Aleppian style of cooking represents a layer of Middle Eastern culture that is unknown to most, but has always been there on the festive tables of a quiet, thriving, and a culturally-supportive community. As executive editor of Deal Delights and Deal Delights II, Dweck compiled, with the assistance of dozens of contributors, hundreds of classic Syrian recipes into two community sourcebooks that remain required references for any novice Syrian cook.Aromas of Aleppo follows the Deal Delights work by striving to document and preserve the enduring history, cuisine, and customs of the Aleppian Jewish community for future generations and will be translated into Hebrew. It all started in mid-1970’s, when the American-born generation of the Aleppian-Jewish community began to displace the methodical, slow food approach of their forebears with the banal ding-and-it’s-done ethic of American cookery. Most Syrian recipes were not written down; they existed only in the minds of older cooks. Dweck heard the shrill of this silent alarm and acted to prevent the loss of her community’s centuries-old legacy. Cognizant of the risk of constantly relying upon the older generation for culinary counsel, she dedicated herself to documenting her community’s valuable cuisine. Dweck is the founder of the Jesse Dweck City Learning Center, a community outreach organization for young men from the Aleppian Jewish community working and living in Manhattan. It is named in honor of her son Jesse A.H. Dweck, who died tragically at the age of 18. She lives in New Jersey with her husband and children.